Use this brief guide to learn how to make a chalkboard out of an old window. If you have a shed, garage, guest house or similar structure on your property, you may very well have a seemingly useless window. 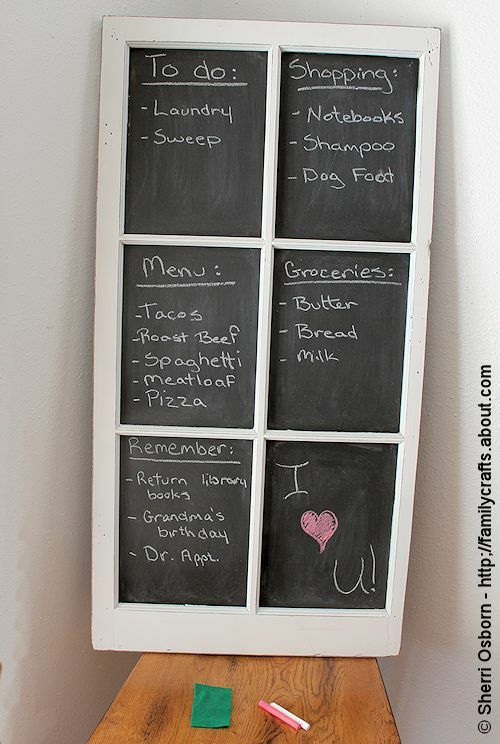 Rather than let it collect cobwebs and dust, you can spruce it up with chalkboard paint. Consider leaving the frame of ​the window looking distressed so you don't have to do a lot of work on the project. You can use either brush on paint or spray paint. It really doesn't make a difference; it is just a matter of personal preference. Start out by making sure your window is clean and dust free. If the paint on your window is old, use a sheet of sandpaper to get off any loose pieces of paint. Don't worry about getting it smooth if you like the character the dings, nail holes and dents give it. If you do sand your window frame, make sure to get off all the dust. Make sure you work in a well-ventilated area. Cover your work surface and set your window on it. Use thin layers of the primer to cover both the frame and the window panes. Wait until one layer is dry to the touch before adding another. When you are done with the primer, let it set to completely dry by following the directions on the can. Once the primer is dry, use masking tape and newspaper to cover each square of the window pane. If you prefer, you can just be careful when you paint the frame. This is easiest if you are using brush on paint. Use as many layers of paint as you need to get the coverage you want. When you are done painting the window frame, let it set to completely dry. Remove the tape and newspaper. If you want the window to look distressed, grab the sandpaper again once the paint is dry. Run the sandpaper over all of the edges and corners to scrape away the paint and show the wood underneath. Of course, this part is optional. Now, you are ready for the chalkboard paint. Use a quality paint brush to apply a few layers of paint. You can use tape to mask off the window frame or just be careful when you paint near the edges of the window panes. Allow the paint to dry between coats. Once done, let the chalkboard paint cure for as long as the paint can says. Before you use your window, condition the chalkboard paint by rubbing the side of a piece of chalk over it and then wiping it clean. Now, you can use your new chalkboard window. If you want to hang it, you can screw it directly to the wall and paint the screw heads. This is a good method to choose if you want to make sure the window does not slip off the wall and break. You can also use eye hooks screwed to the top of the window or buy picture hanging hardware to attach to the back.